After Zhang Qian, a 26-year-old Chinese national who lives in Auckland, New Zealand's largest city, spent over 3,500 yuan ($547) treating his itchy leg but got no relief, he decided to stop throwing his money away and go back to China. "I kept scratching my skin and it left me with dark scars. Doctors in Auckland told me that I had been bitten by insects and gave me anti-allergy medicine," Zhang told the Global Times. After he returned to his hometown, Shijiazhuang, North China's Hebei Province, he went to a private clinic and was diagnosed with neurodermatitis, a skin disease. "It only cost me 52 yuan to get treatment and I was better in a week," said Zhang. Although Zhang enjoys his life in the beautiful port city, he said the way local doctors treat a sickness sometimes just does not get to the point, and he prefers the direct and practical treatment available back in China. Similar to Zhang, famous Chinese actress Li Bingbing recently had to return to China after experiencing a high fever for 16 days during filming in Australia because the local hospital could not diagnose her illness. Li said on her Sina Weibo on December 23 that as doctors in Australia declined to give her antibiotics, her sickness got worse. After she returned to Beijing, she was confirmed to have been suffering from tonsillitis and was released from the hospital after a week of treatment. Li's posts triggered heated discussion with many Net users praising Chinese medical system. Some netizens said that Chinese people should stop holding the belief that "the moon overseas is brighter than in their own country," while others argued that not all people have Li's access to quality treatment in China. Experts said that compared to foreign medical systems, the Chinese medical system has shortcomings, but it also has advantages. They called for the establishment of a hierarchical medical system and lower costs to make services more accessible. According to Zhang, although the New Zealand government provides residents with free medical services, it takes them a long time to get treatment. Zhang said that his friend, a local resident, received non-life threatening injuries after a car accident but had to wait to get surgery because the doctors had already finished work for the day. "We could send him to private hospitals but they were too expensive," said Zhang. 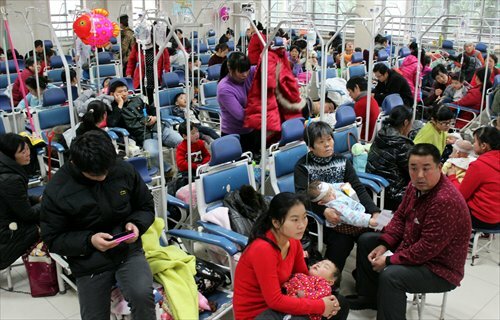 Zhang Haicheng, chief cardiologist at Peking University People's Hospital, said that in overseas hospitals, doctors decide waiting times based on the severity of a patient's condition. Patients who are not in an emergency condition first see general doctors and then can be transferred to specialists after going through several rounds of treatment, which may cause a patient to get worse. Therefore, it may take days for Li to get treatment under the New Zealand medical system. "Many Chinese who live abroad tend to get treatment in China as it is quicker and convenient. More importantly, medical expenses can be higher overseas than in China," said Zhang. However, both Zhang and Zhou pointed out that as China lacks a sound hierarchical medical treatment system which is able to allocate sufficient resources to grassroots health institutions, most patients first go to prestigious hospitals, making it difficult for people to get medical services in a timely fashion. China's State Council in September issued guidance on a hierarchical medical treatment system, which stipulates that a tiered hospital system with clearly defined roles will be established by 2017. Also, by that time the country should have a greater number of general practitioners, and standards at smaller hospitals should rise, reported the Xinhua News Agency. Additionally, patients will be incentivized to seek treatment at their local hospitals. Doctors will also be incentivized to refer patients with minor illnesses to lower-level institutions, said Xinhua. To reduce medical expenses and help people living in poorer, more remote areas to access medical services, in 2009 China launched a three-year project to include 1.3 billion people in the medical care system. From 2009 to 2014, government spending on health amounted to 4 trillion yuan. The medical insurance scheme now covers over 1.3 billion people, 95 percent of the population. "Raising the proportion of reimbursement should also be a part of current medical reform," said Zhou. In 2014, the medical insurance reimbursement ratio stood at 80 percent for urban employees and 75 percent for rural residents.